I have written in essays past about my parents’ conversion to faithful churchgoers in the early 1950’s when I was just a child of seven. At that time, through the eyes of a child, the only dramatics changes I noticed were the all-Downing all night domino/beer binges stopped and I seemed to gather a new bunch of friends at the church. When you’re seven years old, you don’t notice the adults around you very much, choosing rather to size up the kids in your age bracket instead. Such was the case as my family and I began attending Peace Tabernacle in Baytown, Texas, pastored by Rev. V. A. Guidroz. The first adult I remember noticing with any regularity was, naturally, my Sunday School teacher, Glory Guidroz. Glory was one of the several adult Guidroz children who served their parents in some church capacity. A friendly woman with a pleasant face, she made me feel welcome in this strange world of new kids. On my first Sunday at church, she put my name on the attendance board on the wall and a gold star next to it and told me that when I had five stars on my attendance board I would be a genuine full-fledged member of the class. Four weeks later I watched proudly as she affixed my fifth gold star, and I felt like I had arrived. Miss Anniedeen Bateman was a school teacher, unmarried, who lived with her mother. During the summer vacation, they would disappear to Alto, Texas, to a family farm, and then magically reappear about the time school was to start in the fall. A watercolorist, pianist, and singer, very talented in any creative endeavor, she was deeply involved with the music of the church, directing Christmas choirs and whatever other special choirs the church deemed appropriate and singing special songs during services. It was in this activity that she caught the attention of us kids. You have to remember that in the era of the fifties in deepest, darkest Texas (especially in somewhat conservative Pentecostal churches,) practically everyone sung with sort of a down home country twang backed up with a piano and maybe an organ or guitar. Sister Anniedeen Bateman, however, put her musical skills to the forefront and played every song exactly as it was written in the book and sang with an operatic gusto that was so far over the heads of us immature little rug runners that we would listen, giggle, and squirm until she finished her song. (Even as I write this, I am embarrassed.) Occasionally, as we played after services, we would attempt to duplicate her operatic skills, but it was hopeless. I came in closer contact to Sister Anniedeen (as she was affectionately called by the church members) a few short years later when I reached my early teens. She had begun giving piano lessons at her home, and my sister, Judy, had become a favored student, though she was five years younger than I. After Judy had been at it for about a year, Mother decided that I needed some culture in my life and signed me up for lessons also. Actually, I was a little excited about it, and got Judy’s early study books out and began to practice on our home piano. I had about the first six songs perfectly nailed (I thought) and was ready to impress Sister Anniedeen when I finally sat down at her piano. I took off on the first song at about sixty miles an hour with no concept of rhythm, and she yelled (quietly), “Whoa! Whoa! Whoa! Let’s follow the rhythm! Now ready? A-one, a-two, a-three…..” I told myself silently that this was apparently not going to be as easy as I thought. I lasted for about a year and a half, but, once I discovered girls, my piano career (truly regretfully) fizzled. However, she still would not let me off the musical hook. In her eyes, everyone has a musical talent, and she insisted that I receive a few voice lessons, and so, in a matter of a few months, I sang my first solo at church…quavering voice, knocking knees and all. But I found that I sort of enjoyed it. I began to appreciate the artistry of her singing. She enunciated her words clearly and I could feel the spirit behind the words. No one will ever be able to sing "Jerusalem" like she could. It was in my teenage years that I began to see the value of Sister Anniedeen. She took a special interest in the youth of the church, serving as our Sunday School teacher, guidance counselor, and to a certain extent, disciplinarian. She opened her home to youth gatherings and was instrumental in creating the Conquerors’ Club, a social organization for youth which emphasized personal responsibility, devotion to the church, and Bible understanding. The club spread to several other churches in the Galveston Bay area and was highly popular amongst the youth for several years. Our Sunday School classes were heavily Bible oriented, and she was not afraid to offer pointed advice about how we as young people should conduct ourselves. Shirley and I married in 1961, and having been booted out of the Conquerors’ Club due to our marriage, our contact with Sister Anniedeen became limited to church and an occasional older youth visit to her home. Shirley had suffered through the loss of her mother in 1957 due to cancer. My father-in-law remarried, only to relive the same cancer nightmare with his second wife. In 1963, however, we were stunned to learn that a third marriage was imminent. The Reverend James L. Creel announced the engagement and pending marriage to none other than Sister Anniedeen Bateman. It seemed strange at first to realize that Sister Anniedeen wasn’t just “Sister Anniedeen” anymore, but rather “Mom” or “Mom-in-law.” Shirley and I probably had less of an adjustment than the rest of the family to make because we basically disappeared for four years as I joined the United States Air Force in the fall of 1963. Although we occasionally visited Baytown while on leave or traveling to a new assignment, it was not until the fall of 1967 that we moved back to Baytown to reestablish a home. By then, the new order had been well established. Sister Anniedeen brought order to a family which had suffered the loss of two mothers, and the fact that she was new at parenting didn’t seem to be a drawback. After all, once a teacher, always a teacher. She applied her teaching skills to parenting with the same enthusiasm. The cycle was complete when the child of the new union, Rocky, was born. In 1970, our church in Baytown suffered through a tumultuous time resulting in a minister leaving under clouded circumstances. As it turned out, I found that my in-laws and I were on opposite sides of the issue, and, when the climax occurred, there were some hurt feelings and strained relationships. 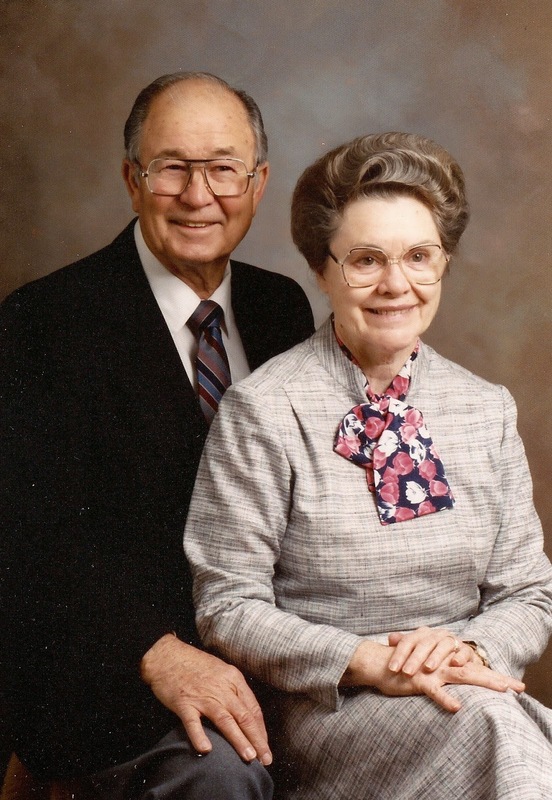 From our marriage in 1963 to 1970, I had addressed my father-in-law as “Brother Lemuel” and my now-mother-in-law as “Sister Anniedeen.” In 1971, my in-laws moved to Casper, Wyoming, to take the pastorship of a church. Shirley and I visited them the next two summers, and somehow a new relationship with my in-laws was formed. That fall I wrote them a letter and said that after ten years of marriage to their daughter, I would like to go beyond the “Brother/Sister” relationship and call them “Mom” and “Dad.” I still remember the wonderful, gracious letter I received in return which I still have stored in my archives somewhere. They have been “Mom” and “Dad” ever since. We moved to Wyoming in 1974, and for the next seventeen years my bond with Mom and Dad grew stronger with each passing day. For the remainder of this essay I will refer to “Brother Lemuel” and “Sister Anniedeen” as Dad and Mom. I haven’t the time to describe my every experience with Dad and Mom. Dad, quick-witted, quick-tempered, opinionated, and outspoken, met his match with Mom, who could match her husband in every aspect except maybe the quick temper. She was far more temperate in her emotions and was the consummate dutiful wife. Serving as the pastor’s wife, she enthusiastically performed her duties, and continued to display her musical talents with piano/organ playing, singing, choir directing…and insuring that we did our parts also. She still reached out to the youth in Sunday School classes and social gatherings, stressing not just the social aspects, but also the need for the youth to have a spiritual foundation. As the years drifted by I began to suffer the dreaded “middle aged spread” and started having to really watch my weight. It was during this time that Mom really began to get on my nerves. OK, I’m just kidding, but she has always been somewhat of a health nut…always watching her calories, etc. So when she would see me eating a greasy hamburger with double meat and double cheese with extra fries, she could not stop herself from saying something. I was tempted to start eating only in the dark, but that’s hard to do in a restaurant. I finally resigned myself to the idea that she was just looking out for my best interests, whether I wanted her to or not. I have written in previous essays of my daily morning trips to their home for coffee and breakfast on the way to work. I was touched after Dad died in 1989 when Mom asked me to keep coming by for our morning visit and coffee. It was about a year later that I truly discovered the depth of her spiritual faith and Christian behavior. A short time after Dad died, our church elected a new pastor. As is the case sometimes, all was wonderful for a while but things began to unravel in a year or so. Controversy began to swirl around the pastor, and, as luck would have it, Mom and I wound up on opposing sides. I am not a person who likes confrontation. When I have something to say, I prefer to write it down, so I wrote letters to two people respectfully stating my opinion and what I though needed to be done. One of them was to Mom in which I also stated that until the trouble blew over, I felt it best not to come by for breakfast in the mornings. Within a few days after mailing the letters, I received a phone call at my office. The caller was the other letter recipient, and it was clear to her that my spirit was bad, I had bitterness in my heart, and I needed to pray through this issue and clean up my bad attitude. It was obvious to her that I was completely wrong. By coincidence, a day later I received a written letter from Mom, and my only regret is that I have since misplaced it. She was so gracious and so understanding, praying that the turmoil would soon be resolved and we could reestablish our relationship. It was so beautifully written that I instantly wanted to resolve any conflict I had with her. As it turned out, the issue was soon resolved, and in short order we were having breakfast again. My respect for my mother-in-law went through the roof. In 1991 Shirley and I moved back to Texas, and Mom stayed in Wyoming even after Dad’s passing. We visited several times, and she came to Texas occasionally, but by 2009, with most of the family in the Houston area, and others leaving the Casper, Wyoming, area, she chose to come back to the land of her roots, also. Shirley and I retired in 2009 and moved to the Spring area to be near kids and grandkids, and Mom settled not too far from us in a retirement home. We all attend the same great church and have enjoyed a closer relationship than ever before. We have had many interesting discussions about the endtime and Bible prophecy. For years, she has been a highly respected Bible scholar and teacher and is a virtual well of information concerning scripture and prophecy. Shirley and I have now been married over fifty years, and my mother-in-law occasionally still harasses me about my eating habits. But what can I say? She is on the north side of ninety now and is probably in better shape than any of us “kids.” She continues to read, study, sing, play, pray, and live a life of impeccable Christian virtue. She has become, not just an institution, but a pattern for behavior. I think I love her.